Donation assets allow you to create donation items, allowing site users to donate money using an e-commerce system. Donations can be allocated information such as a description and specifications for the donation. Once you have added a Donation, you can configure its settings on its associated asset screens. The majority of these screens are the same or similar to those for a Standard Page and are described in the Asset Screens manual. In this chapter, we will describe the Details screen, which is different for a Donation. The Details screen for a Donation allows you to set up this asset. For more information about the Status, Future Status, Thumbnail and Detail sections, refer to the Details Screen chapter in the Asset Screens manual. This section allows you to enter description and specification information about the Donation. Donation Description: enter a description of the donation. This description will appear when the keyword replacement is used. Short Description: enter a short description of the product. This short description will appear when the keyword replacement is used. Details/Donation Specifications: enter the details and/or specifications of the donation. These details will appear when the keyword replacement is used. Unlike a Product, a value field is not available for a Donation. Donation assets have a set currency value of 1 meaning that user donations are determined by the quantity of Donation assets being purchased. For example, if a user wishes to donate ten dollars, ten Donation assets would need to be purchased. As a result, only full dollar values may be donated. When creating an e-commerce system using a Cart and Checkout Page, Donation assets can be linked to the Cart from an Asset Listing Page, using the Add an item to the cart Dynamic Parameter. On the Default Bodycopy of the Asset Listing Page, listed Donations should be linked to the Cart using the HTML structure shown in the figure below. ./?a=<cart_id>: this will send the user to the Cart, where <cart_id> is the asset ID of the Cart. <add_an_item_to_the_cart_parameter>=<amount>: this will add the Donation to the Cart, where <add_an_item_to_the_cart_parameter>is the Dynamic Parameter variable of the Cart and <amount> is the amount of money being donated. The add Dynamic Parameter has been added to the link. The <asset_id> and <amount> fields need to be replaced with the ecommerce setup information. For example, if the asset ID of the Cart was '100' and we want to allow users to make donations of $10, the link shown in the figure below will be used. In the above example, the <asset_id> is 100 and the <amount> is '10', meaning that a donation of $10 will be added to the Cart. Donation assets can also be linked from the item listing to the Cart using the Asset Selections screen. On the Asset Selections screen of the Asset Listing Page, an Asset Selection must be created to allow users to select the amount of money they would like to donate. To do this, right click on the Asset Listing Page in the Asset Map and select Asset Selections. In the following example, we have set the Input Style to a Drop-Down List and the value range from 1 to 10, as shown in the figure below. 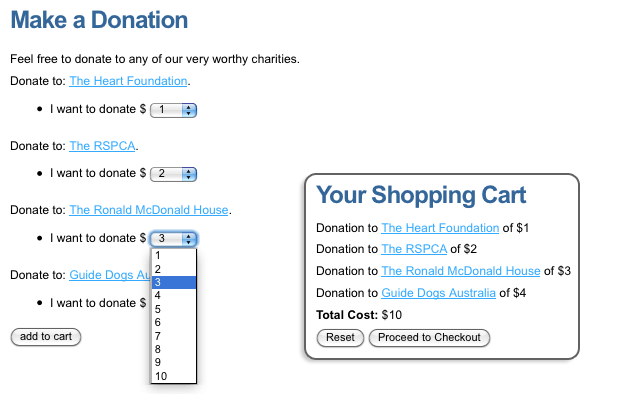 This means that users will be able to select a donation value of up to ten dollars from the drop-down list. An Asset Target must also be created to allow users to add their donation to the Cart. To do this, create a new Asset Target using the Add New Target? field. New fields will appear in the Asset Targets section. Enter a Button Label and select the Cart in the Target; or Asset field. In the following example, we have created a button labeled add to cart with the Cart asset as the Asset Target, as shown in the figure below. This means that when users click the add to cart button, the selected donations will be added to the Cart. For more information on how to set up Asset Selections and Asset Targets, refer to the Asset Selections Screen chapter of the Asset Listing manual. When the Asset Selection and Asset Target are configured, Keyword Replacements will be available to use on the Bodycopies of the Asset Listing Page, as shown in the figures below, to display the selection field and target button. Tip: The Keyword Replacements for the selection field and target button will be determined by the names of the Asset Selection and Asset Target configured on the Asset Selections screen. These Keyword Replacements are available on the drop-down menu on the WYSIWYG Editor. Page. For the Asset Selection to function correctly, a Dynamic Parameter needs to be created in the Cart. To do this, right click on the Cart in the Asset Map and select Details. Create a Dynamic Parameter with the parameter as Add an Item to the Cart and the source as GET Variable Name and click Commit. In the GET Variable Name field, enter the name of the Asset Selection (in this case buy), as shown in the figure below. Once you have done this, the Donations will be able to be added to the Cart when a user selects the amount they want to donate and clicks the target button, as shown in the figure below.